Transit’s abstract milieu evokes a distinct sense of placelessness, but place barely seems to matter in this film. Director Christian Petzold’s version of France is neither here nor there, balanced upon some heterotopic precipice between World War 2 and the present day, between origin and destination. It’s set in the Paris and Marseille of six decades ago, but with few temporal trappings: besides an old-school radio and the absence of ubiquitous iPhones, the buildings and dress could’ve been pulled from modern-day France. Most of the action happens early on in the film. In a Parisian hotel room, Georg discovers a prominent Communist writer and fellow German, Weidel, has committed suicide. Taking Weidel’s scattered belongings, Georg narrowly escapes a police raid and flees to Marseille. There he (inadvertently) assumes Weidel’s identity to guarantee safe passage on a ship leaving France in three weeks—and it’s in this three-week stasis where our story really unspools. In transit, relationships are evacuated of any real meaning. Weidel’s elusive wife, Marie, takes shape through letters and conversations and inexplicably mysterious encounters with Georg that later unfold (perhaps too quickly) into a tentative romance. Although some interactions between Georg and Marie are stilted, Franz Rogowski and Paula Beer’s nuanced performances intrigue enough to carry it off. Their endless days of waiting are made sluggish and disorienting by Hans From’s exquisite camerawork, simultaneously fluid and almost weary. The listless characters drift from place to place, and we keep returning to the same rolodex of sites: the pizza bar, the uniform ghettos, the empty hotel room. The constant transience is suffocating, but so is staying put. 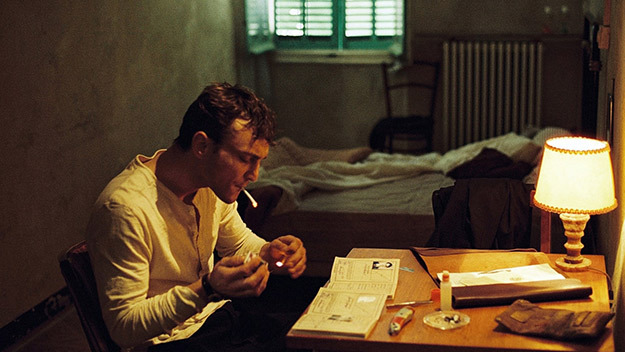 Petzold unsparingly portrays Georg’s tedious quotidian life, lingering over scenes in a bare-bones hotel room he can ironically only rent once he proves he has a ticket to leave. The only way Transit visually recalls its period tale is the alienating colors—rich, stark, a little dreamlike. Over and over, Petzold inundates us with scenes of narrow cobblestone streets and bleak embassy waiting rooms, so that when we eventually see a ship pulling out of port, it’s so bright as to be jarring; the transitory space has become too familiar, too permanent for comfort. Halfway through the film Georg describes Marseille as a port, where people come to tell their stories and to be listened to, as though saying it aloud might validate their personhood. Identity is rendered deliberately superficial and interchangeable: a name on a visa, an apartment that changes hands with little preamble, and a narrator we meet only in the last few minutes of the film. What little the immigrants do own they carry with them, leaving no trace of themselves behind. Of course, it’s hard to ignore the film’s incisive commentary on the precarious state of refugees. It may be based on a 1944 novel, but it’s one that rings true even today, especially today. Yet its social agenda is deftly handled, sharply self-aware without being derivative. Petzold’s bold and possibly divisive choice to make the film an ahistorical one forces his audience to actively interrogate the liminal nature of what it portrays. In a particularly poignant moment, a fellow immigrant trying to leave Marseilles sees Georg on the street and invites him for dinner. “I don’t want a conversation,” she says, “I just want to eat and drink and not be alone.” Later they walk through deserted streets and talk, the closest the film comes to a genuine connection, a mutual recognition between people who otherwise go unrecognized. They stop against a railing for a smoke. The camera closes in tight as Georg lights her cigarette, then turns to light his; when the camera turns back around she is gone. The next shot shows her sprawled below, having jumped off the sidewalk. Her death feels matter-of-fact. Everything has changed, yet nothing has changed; Marseille goes on. And perhaps that is part of Transit’s forceful, provocative appeal: the realization that so little has changed, that for those caught in the film’s strange limbo, some things never change. Written by: Crystal Lua on October 8, 2018. Last revised by: Double Exposure, our reviewer, on October 18, 2018.